These 2 young ladies are my Step-daughters Jericho and Megan. 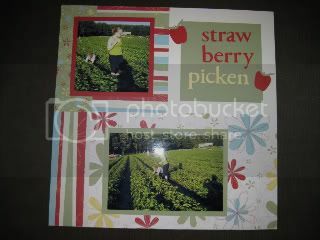 We try to go strawberry picking atleast once a summer. This year, 2008, I was finally smart enough to take my camera. 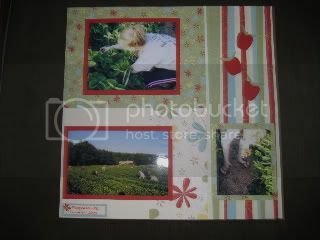 This paper pack is called Lets Get Together and the layouts come from the Cherish How To book. In the book the layout is called Keep Inproportion. I cut the words out using my Cricut and the strawberrys I drew and cut myself. Aren't I such a talented little bugger! I really love your layouts. You scrapbook a lot like I do. Simple. Your layouts are beautiful.